The hamburger is quintessential American fare, but sadly it has been all but ruined thanks to fast food chains and mass-produced meat. 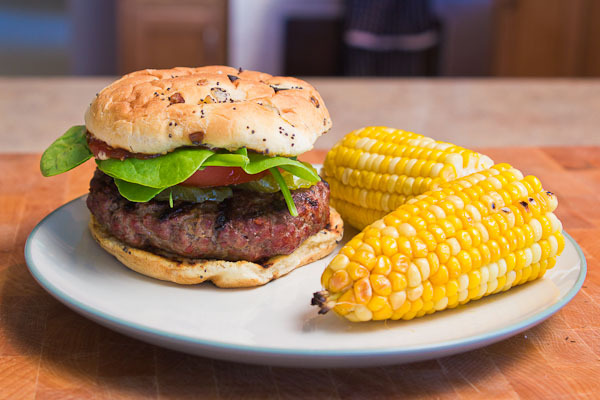 Our image of a burger today usually consists of a greasy and unhealthy food you pick up from a window or dried out and flavorless items at a cookout. Of course you can get a pretty good burger at many restaurants, but you will typically pay a premium. While these are certainly an improvement, they usually still lack the quality of the burgers of yesteryear. 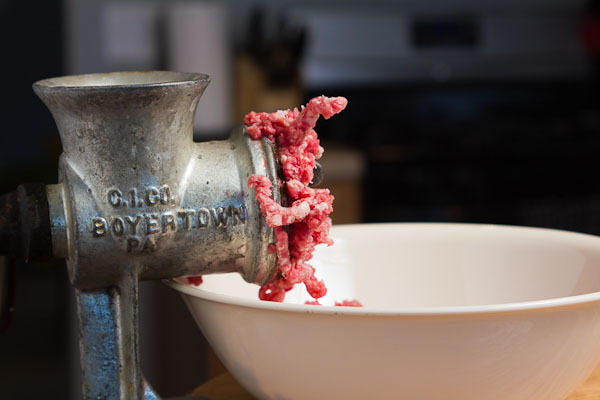 I’m going to walk you through the process of grinding your own gourmet burger meat and in the process, save some money. A burger is such a simple thing, so why are they constantly done so poorly? Let’s start with the main ingredient: ground beef. Go to any supermarket and you can find the shelves stocked with more ground beef than you can shake a stick at. 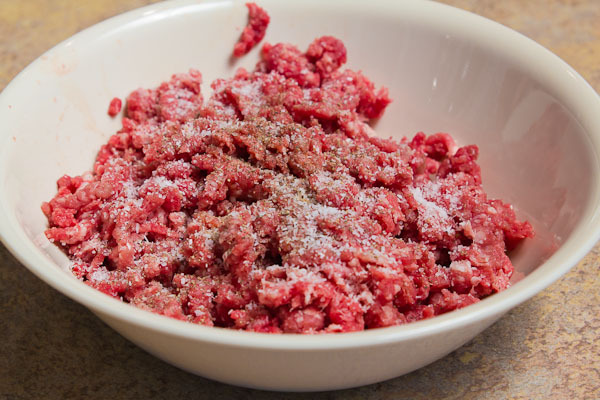 You’ll find regular hamburger, ground chuck, ground sirloin, and sometimes a mixture of grinds. That’s all well and good, but if you knew how this meat was often put together you’d probably be quite put off. In fact, did you know that the typical package of ground beef at your supermarket may contain parts from hundreds of different cows? And in many cases, ground beef gets the lowest quality beef such as old dairy cows and parts of the animal you don’t even want to imagine. Ground chuck is better since you at least know you’re getting chuck meat, but that’s about where the added quality ends. And in many stores, the butchers make their own ground beef by taking all the unsold and dated cuts on the shelves and grinding them up to resell as hamburger. Sure, it’s safe to eat, but not what I’d call fresh. Don’t flatten the meat with a spatula. Don’t over cook the meat. Let me address these briefly. The first problem is overworking the meat. When people make patties at home they have a tendency to mix the meat up with their hands so much that the texture almost becomes a paste instead of retaining the small ground chunks. This is the number one reason you end up with tough burgers with an unpleasant texture. Next up is the seasoning. Don’t get cute and think by adding twenty spices that you’re going to overcome everything else that goes wrong. Like a quality steak, if done properly you want just a tiny bit of basic seasoning to enhance the natural flavor of the meat. After preparing the burger it’s time to cook it, and that’s where flattening and overcooking the meat comes in. DON’T push on your patties with the spatula while on the grill and force all the juice and moisture out. That’s where the flavor comes from. And finally, burgers cook faster than most people realize, so overcooking is probably one of the biggest problems. If you’ve ever had those hard hockey puck burgers at a friend’s BBQ party, you know what I’m talking about. To give you an idea, a 3/4″ patty on a hot grill will probably be more than well done in just ten minutes. How many times have you, or seen someone else, standing over a grill flipping burgers for 20 minutes at a time? It’s no wonder they become dry and tasteless. Now that you know what not to do I bet you can already take your existing burger recipe and improve the end product by 100 percent. But we still need to address the quality of the meat. 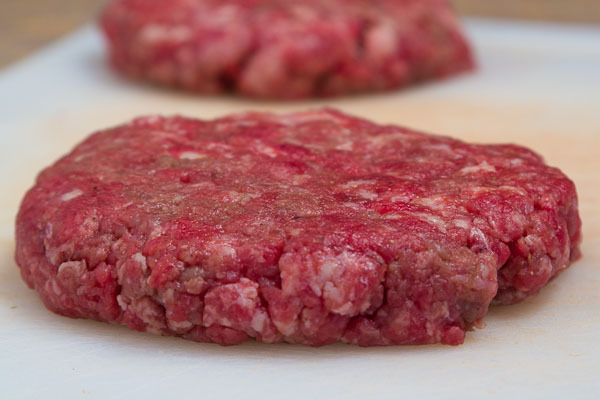 If you want to control quality, you’ll need either a trusted local butcher, but since those are hard to come by these days your best bet is to grind your own hamburger meat. By doing so you can pick the freshest cuts of meat, adjust the fat content how you see fit, and control the size of the grind. With pre-packaged ground beef you’re at the mercy of many other factors. First things first, you need something to grind the meat with. You basically have three main options: a hand-crank grinder, a stand mixer with a grinding attachment, or a food processor. If you already have any of the three, you’re in luck. If you don’t, then you’ll have to find one. Honestly, I love both my food processor and stand mixer, and they get used regularly. But not for grinding meat. I’m old school and use a century old hand crank that clamps to your counter top. If you’re on a budget or just starting out, I’d recommend one of these as well. In fact, you can often find them at garage sales or second-hand stores for about five bucks. Otherwise, you’ll probably have to spend $25-40 on an entry level new grinder. Now it’s time for meat selection. What cuts of meat work best for grinding your own burgers? Really, the choice is yours, but a good starting point is chuck steak (or roast if you are making a lot of burgers). That’s because chuck already has a pretty good meat to fat ratio of about 80/20, which is the sweet spot for burgers. But this is where you can get creative and mix and match cuts of meat to give you the ultimate in flavor and texture. I know a lot of people claim brisket makes the absolute best burgers, so experiment and see what you like best. Just keep in mind that you do need some fat in the burger, so if you go with very lean cuts you’ll probably want to add back in fat of some sort. Pay attention to cost, but don’t get hung up on it. It’s hard to compete with $1.89/lb bulk hamburger at the supermarket, but remember, we’re after high-quality gourmet style burgers, so comparing to that is apples and oranges. So buying higher quality cuts of meat may be closer to $3 or even $4/lb, but that’s still a steal. 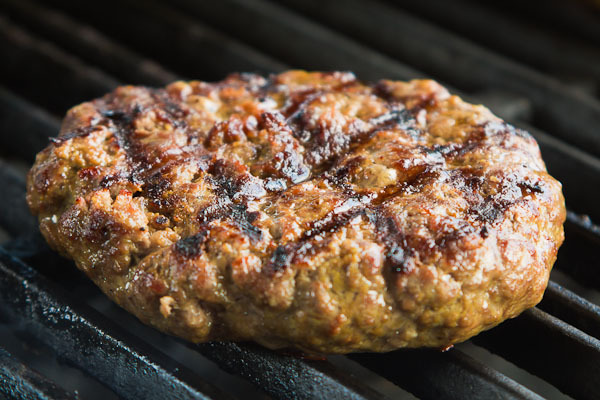 Think of it this way: a pound of meat will make three 1/3 pound burgers, so even at $3.50/lb you’re only really paying $1.17 for a burger that will will rival the quality of a $15 burger at a decent restaurant. Now that’s savings! And here’s another tip to help you save money. Check with the butcher behind the meat counter and ask if they have any fat scraps in the back. A lot of times they will have fresh fat trimmings that you can get for free since they often discard most of it. With free fat you can then just buy whatever lean cut of meat you want to mix with it. Have your grinder and meat? Good. It’s time to get to work. To see how simple this process and recipe is, look at everything you need below. 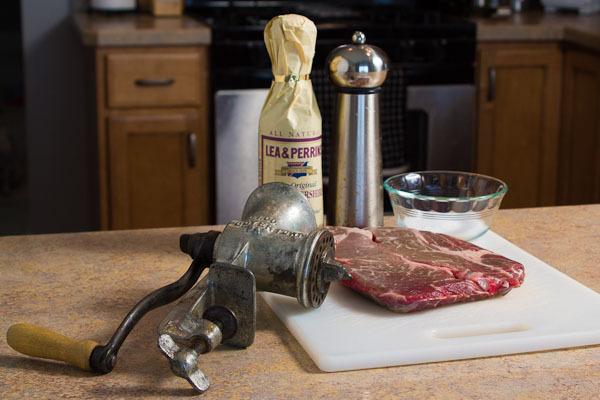 It includes a grinder, a one-pound chuck steak, salt, pepper, and Worcestershire sauce. That’s it. No getting fancy and putting a dozen ingredients into the meat that will only mask the flavor of the beef because we want the beef to be the star. One more tip before this meat hits the grinder: throw it into the freezer (unless you’re using a food processor for grinding). This is a step that most people miss and it only leads to frustration when trying to grind meat. So, put your cubed meat and grinder in the freezer for about 30 minutes. It won’t freeze completely, but it makes the meat quite stiff. You want to do this because the grinding process creates heat and what can happen is the fat starts to melt while you grind it along with creating more of a mushy texture in the final grind. That’s no good, so simply chill the meat and equipment in the freezer for a bit and your job will be much easier and you’ll have a better final product. Step 3: Seasoning the meat: Depending on your grinding method it may take a couple minutes per pound, but after all said and done you’ll be left with a bowl of perfectly ground meat. Seasoning the meat is simple and a lot of it will be up to your personal preferences, but remember from earlier that less is more. When you have a high-quality product to begin with you don’t need to use a bunch of added flavors to get something that tastes good. So my typical seasoning recipe is quite simple. Per pound of meat I usually add a couple tablespoons of Worcestershire sauce, a few pinches of kosher salt, and a healthy dose of freshly ground black pepper. That’s it. If you’re used to adding a bunch of spices to your hamburger, I’d challenge you to start very simple like this first and see how you like it. You can always introduce new seasoning next time, but I think you’ll be surprised at the flavor of this and may never go back to your old recipe again. Step 4: Making the patties: Another area that trips some people up is making the patties. After adding the seasoning don’t go in with your hands and pulverize the meat. All you need to do is use your fingertips to lightly mix and incorporate everything together. Remember, overworking the meat will make it tough and give it a bad texture. You want a light and fluffy burger, so go easy with it. The other trick to making patties is size. Too small and they are almost certain to dry out and get overcooked, but too big and they are unwieldy on the bun and harder to cook so that the center is done properly without the outside being overdone. The best starting point is about 1/3 of a pound per burger, or a little under six ounces. If you started with a known amount of meat (in my case one pound) you can portion it into thirds or quarters or whatever amount you had to give you a rough size. So for me, with a pound of meat I just divided it into three equal sized chunks and that gave me my 1/3 pound. You only have to do this once and then you’ll see the size of the ball of meat and will know for future patties how much you need to get close. Step 5: Hitting the grill: You can cook your burger indoors in a skillet, but in my opinion the best way is over the open flame of a grill. It adds just one more dimension to the final flavor that can’t be replicated indoors, so that’s what I’m going to do here. The secret to a good grilled burger is high heat and a dimple (don’t worry, I’ll explain the dimple.). If you’ve ever cooked burgers on the grill before you’ve probably encountered the incredible swelling that sometimes occurs. You know, when you had a pretty consistent and flat patty to start only to end up with a small, yet super thick burger in the center. That’s no good, so that’s where the dimple comes in. When you put your burger on the grill use your thumb and push down in the center of the patty making a small dent or dimple. What this does is help control the shrinking that occurs and will give you a very consistent thickness across the patty when you’re done cooking. It took me years to learn about this trick, and it’s amazing how such a simple thing can work wonders. Step 6: Bonus corn on the cob tips: Before we assemble the burger I wanted to include how I made the side dish of grilled corn on the cob. 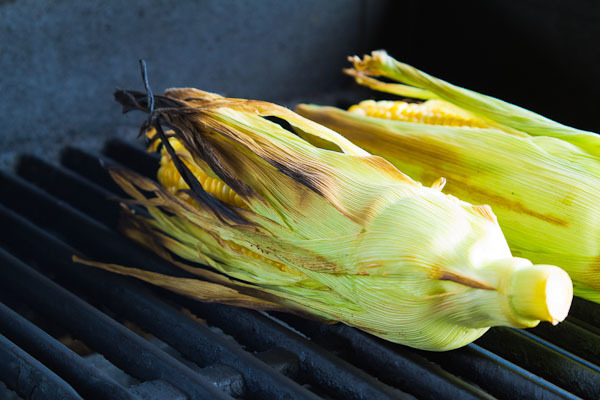 There are many, many different ways to prepare corn on the cob, but whenever I grill the corn for guests or at a party I always get a lot of questions about how to do it. While there are a few different ways to grill corn, I’ll show you my favorite method that always goes over well with everyone. First, I remove a few of the outer layers of the husk and then snip off the ends with a pair or scissors. Then I pull back the husk about 90 percent of the way so that it’s still attached at the base and remove as much of the silk as I can. Then the husk gets loosely folded back up over the corn. I like this method because it protects most of the corn from direct contact from the grill while still allowing a little charring and getting some of that smokiness to the kernels. And that’s it. Once it’s done just let the corn cool for a few minutes so it’s easy to handle and pull off the husks. 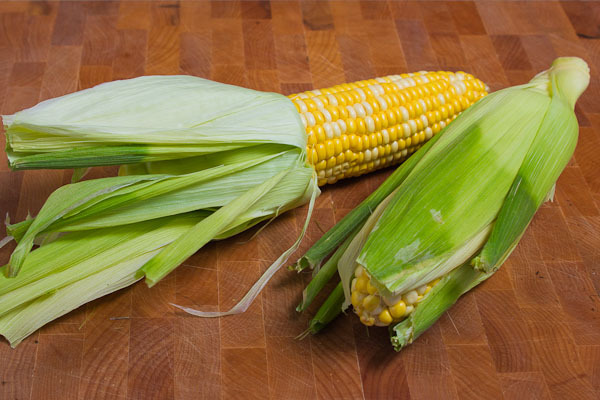 You’ll be left with perfectly done corn on the cob that’s ready to be slathered in butter, salt and pepper, creole seasoning, or whatever you like to top it with. 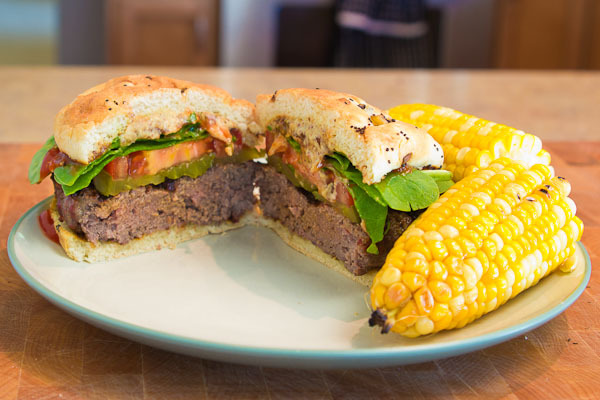 Step 7: Assembling your burger: If you’ve followed all the above steps you’re ready to build your perfect homemade gourmet burger. When it comes to toppings there are few rules to follow. In fact, that’s the best part of just using a very simple seasoning on the meat itself, because it works with any combination of toppings. If you get too crazy with burger seasoning you can limit yourself somewhat in complimentary toppings. The only rule I have is to use good bread. Seriously, why go through the trouble of making a delicious hamburger only to slap it on the cheapest white bread bun available? Do yourself a favor and spend the few extra cents it costs to upgrade to a premium package of buns. For my burger I went with an onion and poppy seed bun and tossed them on the grill for about a minute just to toast them up nice. Then go ahead and load it up with whatever you want. Here I used baby spinach, spicy mustard, a little ketchup, fresh slice of tomato, and a few pickles. But hey, it’s your burger, so go wild. And here is the bad boy sliced open. Admittedly, it got real close to the well done stage, which I don’t particularly care for, but time got away from me while I was busy taking all the pictures for this post. But the good news is that when you make a burger properly by using fresh meat, don’t overwork it, and don’t squeeze all the juice out of it on the grill, you’ll still end up with the best and juiciest hamburger you’ve ever made even if it is well done. Back at the beginning of this article I mentioned you could save money by grinding your own meat and building a gourmet burger. After all, this site is about saving money. I know some people will be quick to point out that better cuts of meat cost more, buying a grinder costs money, springing for fancy buns and toppings will add up, and it takes time to grind your own meat. That’s all very true, but keep in mind we’re not competing with bottom of the barrel mystery meat thrown on a tasteless white bun with just some ketchup and mustard. 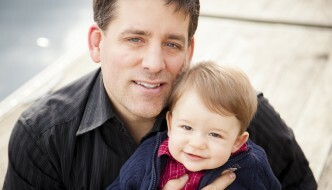 This is about creating a good restaurant quality meal for a fraction of the cost. In fact, one serving of this meal costs even less than a happy meal at McDonald’ s and it tastes a thousand times better and is even better for you. 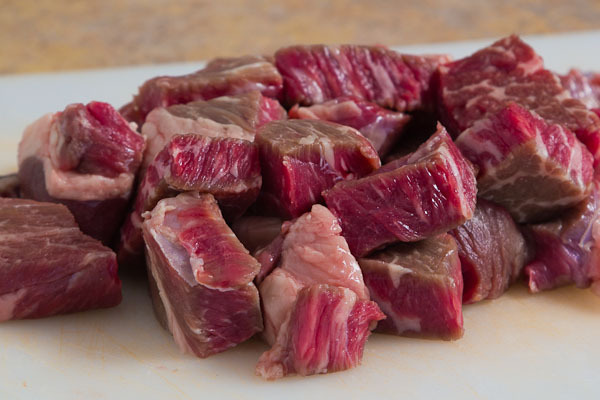 Starting with the meat, I picked up a one-pound chuck steak for $3.89/lb. It wasn’t on sale and I could have saved money by using different cuts or getting some free fat from the butcher, but I wanted to stick with something easy off the shelf. $3.89 gave me three patties, so per serving that came to $1.30. I found an 8-pack of the onion buns for $2, so that’s 25 cents per serving. As for the spinach, it was just something left over in the fridge from a salad. A whole bag was about two dollars, so the topping for the burger maybe cost 10-20 cents at the most. And just one slice of tomato maybe cost another 20 cents. Pickles and all the other condiments were already stocked in the fridge and cost is negligible. Finally, corn on the cob was six ears for $2, so one ear was 33 cents. Obviously, costs will vary based on location and season, but there is a lot of margin to work with for saving money. Look at that. A gourmet hamburger with a side all for under $2.50! It’s cheaper than even the cheapest fast food burger and you’ll find that this burger tastes better than probably any expensive burger you’ve bought at a restaurant, where it isn’t uncommon to pay ten dollars or more for a burger with fries. Even at a cheap sit-down restaurant it’s hard to get a hamburger meal for under five or six bucks, so the savings and quality you’re getting is great. It’s time to change your idea of what a hamburger is and save money in the process. You’ll impress your friends and be on burger duty for gatherings for years to come. Like this recipe? Then be sure to check out my award-winning chili recipe, crockpot pulled pork, shrimp and pasta recipes, and incredibly cheap homemade salsa recipe. can i grind meat for hamburger with my electric grinder with a plastic or nylon auger??? Ohhhh... That look tasty! Btw, can you add the seasoning while you're grinding? For example, season the beef cubes and then pop into the grinder? That would eliminate the need to stir in the seasoning. Or would the season just get stuck inside the grinder? Wow, Jeremy that is one epic post! Now I'm off to find a meat grinder.